In particular, I remember working with Database Mirroring (DBM) as part of an interesting -and complex- HADR setup. Visualize a 4-node windows fail-over cluster in Data Center 1 with SQL Server installed on each node (lets call it a 4XActive). We have high-availability covered here via the clustered instance. Given an outage for any given node, the SQL instance will move (fail-over) to another node. On the other side of town, in Data Center 2, is another 4XActive. No automatic fail-over – yeah DBM has auto-fail-over capability but I’m thinking more about application connections… it was not easy to quickly re-direct connections from DC1 to DC2. I bet you saw this coming, but the answer to these limitations -and others like them- came along when SQL introduced Availability Groups. In this case we add a cluster node in a remote data center to a standard AG configuration. This is the DR node (and it might also serve dual duty as the read-replica). Seems legit, right? But what are the drawbacks? To my thinking, there is a lot of management complexity. 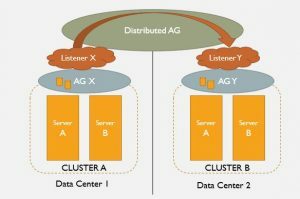 Consider the configuration and administration of a cluster over WAN and multi-domain and\or multi-subnet clusters. What if you could have the best of both worlds? Local availability groups in both the production and DR data centers, optional scale-out reads on the DR side, and replication between the two? Check it out, that is just what we get with Distributed Availability Groups. This entry was posted in HA|DR on June 23, 2018 by admin. Ca Va! No, I don’t speak French but that never stopped these guys: Foux Da Fa Fa. And this title, as they say in France, has a certain “oh I don’t know what” ring to it. 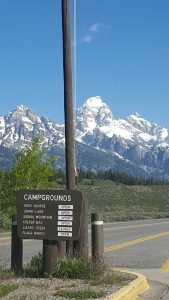 In June my friend Dan and I climbed to the summit of the Grand Teton. 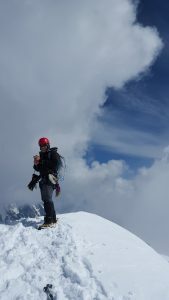 We had tried this climb quiet a few times in past years, so it was excellent to finally achieve it. I love it there and I want to go back. 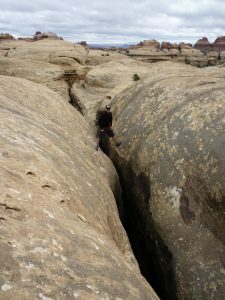 The Maze is one of three districts in Canyon Lands National Park. It has so much great stuff: natural and cultural history, rivers, rocks, and sky. 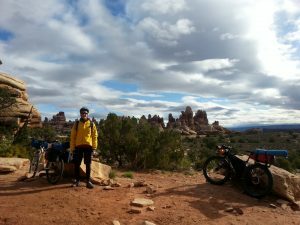 My friend Greg and I loaded up our bikes rode in the 20-or-so miles to set up a base camp for a few days of exploring. I love it there and I want to go back. Back to the professional side of things, I had the chance this year to present at the Professional Association of SQL Server. 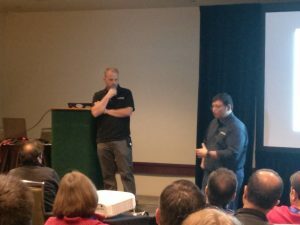 I partnered up with Pinal Dave to deliver a talk on Database Backups in SQL Azure VMs. Pinal is a great guy and I really had fun hanging out with him while we prepped. (Our topic and presentation slowly gelled as we took every opportunity to meet, both in Bangalore IND as well as Seattle USA). The 10am presentation itself went well with Pinal’s exuberance and humor saving us all from falling back to sleep. We ended up with a deadpan\comic dynamic as you might be able to see in the photo. Not sure I’ll ever get the chance to do that again, but if I do I’ll take it. 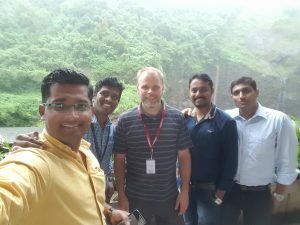 I visited Mumbai and Bangalore India for my second time (last time was 2014). This trip I gave a few classes on Azure to DBA colleagues but just as importantly I had the chance to hang out with awesome people in a really cool country. I love it there and I want to go back. 2. OK 2017, LETS GO! The good news for our 2-hop plan is the intermediate SQL2008 instance need not be production caliber any way – it’s a just a temporary stop-over on the way to update the DB so we can restore it to SQL2014. The bad news is, this 2-hop plan complicates the migration plan and extends the potential outage as we copy\paste database backups or data files over the network between the three servers. We’re using detach\attach here rather than backup\restore but that’s not too important – things would work out fine either way. The thing to notice is that we lost a step and – more importantly – gained back the time it takes to “6. 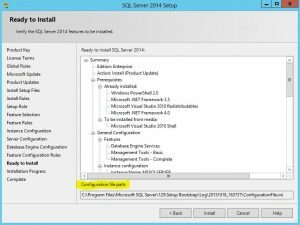 copy the backup to the SQL2014 server”. We only need one copy operation – from the SQL2000 server direct to the target SQL2014 server. Depending on DB size, network speeds and copy methods, that might be a lot of time saved. How can this work? Because SQL2008r2 (and SQL 2008 with -T1807) allows the database file path to be a UNC – i.e. 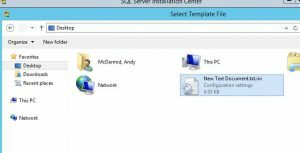 in this case a file share to the DB files on the SQL2014 server. Read up on it here: Description of support for network database files in SQL Server. This entry was posted in Database Admin, Migrations, Updates on August 18, 2016 by admin. 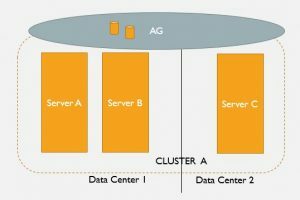 Consider a 2-node cluster with 7 instances. Each node has 8CPU (logical) and 64GB of RAM. It’s a (so-called) active\active configuration. Two of the instances are especially high-resource-use and are segregated to their preferred node. The other instances are relatively quiet, using minimal CPU and RAM, and are split-up 2 and 3 to their preferred nodes. This is what I’m working with recently and I decided to write up a quick post on apportioning memory to these clustered instances. To start, when I came on the scene, min and max memory for each instance was configured as if all the instances shared a single server (node). Total RAM dedicated to SQL instances cluster-wide here is 45GB leaving plenty of head-room even when all instances are running on one node. That is ok and it certainly ensures if (in the case of an unplanned outage) or when (in the case of a planned outage) all instances fail over to a single node, there will be enough RAM to go around for each instance. But, in the day-to-day preferred configuration, with one high-use instance on each node, that leaves many GB of RAM unused (and un-usable per the max memory setting). So I want to re-apportion memory among the instances for the typical, day-to-day operating configuration and give more of that unused RAM to our two high-use instances. I start by understanding there will be times when all instances will run on a single node. When that occurs, how much of the total RAM should SQL use? In this case I’d like to leave ~14 GB to the OS and other, non-sql engine processes. So that leaves me with 50GB for the SQL servers and a question of how to split it up among the instances. This is where a multi-server query comes in handy. If you create a local server group in SSMS (or use a central server) to include all the clustered instances and run a query against them, you can begin to get a sense of which instances will need more memory and which will need less. Here is a query I use as a mulit-server query to capture a snapshot of each instance’s minimum and maximum memory configuration, total and target memory usage, and PLE. if you add it up, total minimum memory is 50GB (50176MB). This is what each instance gets – guaranteed (some exceptions apply 😉 ) – when everything is running on one node. As for max memory, note that memory total for each node adds up to 50GB. So, in active\active mode the SQL servers are able to utilize close to the available RAM (50 of the 64GB) and thereby improve performance. This all works out fine for any variation of a fail-over – either the whole cluster, or just for specific sql services moving around. Of course, the only ideal situation is when each instance is on it’s preferred node since that is what we just configured for… Any other arrangement should be considered temporary. If you have more than one NUMA node you may need to tweak the query above. Read-up on SQL Skills take on PLE per NUMA nodes here (which also links to the source of the idea behind the ‘churn’ metric in the query). One last thing, changing max and min memory settings clears the procedure cache. Be careful out there. This entry was posted in Database Admin and tagged memory on February 8, 2016 by admin. Check this out – the almost last page of a SQL install, Ready to Install. See the configuration file path at the bottom? Recently I have been doing many SQL installs on Azure VMs. As AOAG ‘nodes’, each install needs to be, basically, the same. There are options for imaging Azure VMs but in this case I don’t have access to the portal. As a time saver I have been using these configuration files. As I complete the first install with everything set up as required, I copy the configuration file path and then kick off the install. I paste that path into Windows Explorer which opens the .ini file — select all and copy. Next I move to my secondary, or secondaries, and quickly create a new text file on the desktop, paste, and save. When I fire up the install-able on the secondary, I don’t go to ‘Installation’ as usual, instead I go to ‘Advanced’ and choose ‘Install based on a configuration file’. Now I have the chance to browse to the .ini config file on the desktop (kinda PITA that it has to be an .ini). Once that loads I’m off and clicking! Next, next, next, next, next, next, next with Taylor Swift tunes echoing through the catacombs of my mind. Where necessary, I still need to input passwords, but otherwise all the “blank spaces” are filled in; feature selections, root directory, shared feature directory, server and engine configuration (e.g. data directories), and so on. No big deal, but a bit of a time saver when I want a set of SQL Servers to ‘match’ and it helps me to avoid one-off mis-configurations. This entry was posted in Database Admin, Uncategorized on October 18, 2015 by admin. Take a second to consider this amazing time we live and work in. We are tech pros and we are riding this huge historical wave of the information revolution. This revolution is not even close to over, we are somewhere in the middle of it all and who knows how far it will take us. But one could say it all started somewhere around the invention of the telegraph. As DBAs, perhaps we can point to our own little stripe of the revolution beginning with Dr. Cobb’s renown RDBMS paper. Somewhere there along the line after that, and after data became a ‘thing’, the DBA profession grew from necessity and progressed into what we do today. But I’m here to say the DBA type has been around long before IT and data and the need to manage and secure data. Somebody has always been there, working diligently, keeping things running smoothly; sometimes completely behind the scenes but also sometimes as supporting actors in classic situation comedies. Folks, these are the for-bearers of our esteemed profession. These are the proto-DBAs we have evolved from. Let’s take a look at a few prime examples of our proud legacy. That beanie, that smile, the pocket full of pens and gauges … this guy is capital D.B.A. personified. 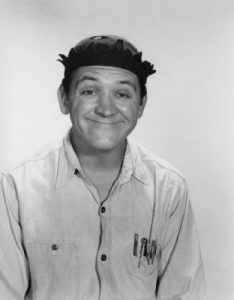 Way before anyone was tuning stored procedures, Goober was keeping the squad cars running like a scalded dog and making sure Aunt Bee’s Hudson made it to the market and back. Once, he disassembled Gilly Walker’s car and rebuilt it —from the ground up — in the court house! Talk about skillz! Reminds me of that one time I did that thing with transactional replication… Goober and his fellow proto-DBA cousin Gomer kept the gasoline and commerce flowing in Mayberry, NC. Bonus: he speaks truth to power! 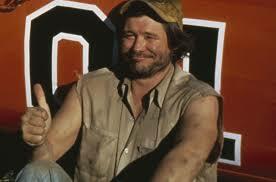 Another genius mechanic from the deep south, them Duke boys could always count on “Crazy Cooter”. 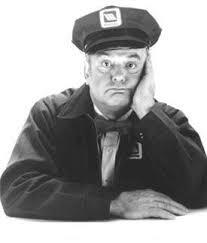 Fast-forward 30 years, drop this guy in DT Hotlanta, and people would instinctively know – That guy is a DBA. General Lee draggin’ it’s tail? 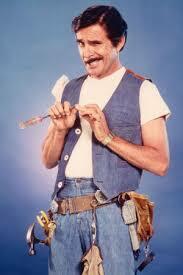 Cooter can fix it. Meanwhile y’all can borrow his super-charged El Camino. Now tha’s some high availability I tell you what. What’s that, chasing Boss Hog’s counterfeiting thugs and now the El Caminos crashed? Shooooot, proto-DBA Cooter’s got you bacccccccckeeeed-up. Use his super-charged 1971 Chevy pickup. It ain’t pretty, but you’ll still outrun Roscoe P. Coaltrain… queue-queue-queue. Never without his tool belt, Dwayne Schneider is there for you anytime day or night, all you have to do is call or page or email or text or skype or IM him. He’s not in his office – he’s waiting just outside your cube. He can fix anything, he can fix everything. One day at a time. And on that key chain there… he has the master key! Do you have your responsibilities at your shop just so totally dialed that you find yourself whiling away long afternoons staring into the screen like Ol’ Lonely here? Me either. But this proto-DBA and his super reliable Maytag washing machines is setting the example for all of us on how it’s done — I hope you are never lonely but let us all aspire to this level of greatness. Maybe you are thinking – hey, you missed the professor from Gilligan’s Island, My Favorite Martian, and Wally Cleaver. No, those are examples of proto-developers. I hope that clarifies things a little. Who are your favorite proto-DBAs? About the author: Drawn to database work since discovering the SQL language uses all caps, for related reasons, Andrew is now learning MongoDB administration. This entry was posted in Database Admin, real funny guy on October 9, 2015 by admin. What would a perfect SQL Server health check report look like? Here’s a brain-storm wish list of my dream sql health check (Did I really just say that? Dream sql health check? I did, didn’t I. That’s it, I’m knocking off early for a pint). Deliverable to other DBA or interested party – focus on showing steady improvement or consistently high overall health. Should be explainable, organized, professional, comprehensive, readable and understandable. Should satisfy – to some degree – typical audit requirements. Quantifies health (e.g. 60%, B-, 5/10). The health quantification should be meaningful and easily explainable. Leverages post SQL2008 out-of-box ‘health’ features – system health extended events and ring buffers, policy based management. Include some functionality that examines policies in the Policy Based Management for specific categories of policies and reports on them. Include some functionality that examines jobs for a specific category that would indicate a custom maintenance job and possibly prioritize them in the report. Allows exclusion of some checks, but this idea can be expanded on so that – for instance – a daily health check is executed for just the backup section of the report. Via a SSRS subscription or db_mail this backup report would be emailed to the DBA team and\or the DB owner for morning review. This could be helpful solution for a number of different frequently requested reports – index frag, disk space, ect. Incorporate an ‘.ini’ configuration file for each instance (could be txt or xml) to keep ideal configurations. Initially the ini file contains best-practice\default values, but the DBA either brings the instance in line with the best-practice\default values or – in case of exceptions – edits the ini file to match the instance settings. In this way the overall health visibly improves. There are three categories health check info falls into. A report could be organized according to these categories and with sub heading for server, instance, database, table levels …. And here’s a list of what could be included in each category. SQL Service has lock pages in memory? 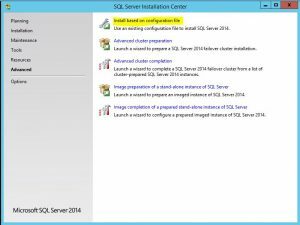 SQL Service account instance file initialization? Resoure Gov enabled\configured Login trigger? … end of brain dump! Now, time to get to work and build some stuff! I’m sure there could be more … whats on your SQL health check list? This entry was posted in Database Admin and tagged health checks on June 16, 2015 by admin. 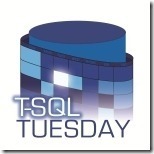 TSQL Tuesday #67: Why extended? And why events? When I say Extended Events, what immediately comes to mind? C) When I say Extended, you say Events. So … why “extended”? And why “events”? Let’s start with this blurb from MSDN: “All applications have execution points that are useful both inside and outside an application. Inside the application, asynchronous processing may be enqueued using information that is collected during the initial execution of a task.” So while the SQL engine is humming along doing it’s stuff there are points within the executing code where stateful information can be branched off and made available to a monitoring application (in this case, XE). When the executing thread hits those points… that is an event. Just a quick review of the Extended Event feature will make it apparent that it shares many events with SQL Trace Events: SQL:Batch Completed = sql_batch_completed, Missing Join Predicate = missing_join_predicate, etc. In fact, since SQL2012 , Extended Events include ALL the events available in SQL Trace. And you might notice, as I did, that there is also a lot of overlap with the events available via DDL Triggers as well as in Event Notifications. AHA, I said to myself, and this was –for me -a big insight (YMMV), under the hood all these events are all the same thing! I was super lucky to get a chance to attend a SQL Skills class a few years back and they tell everyone in class this: If you have any SQL Server question you can email us and we will email you back. So I emailed a question to validate this idea and sure enough those guys got back to me within a day (so cool), saying – more or less – yep, under the hood XE events, SQL Trace events, DDL Trigger events, and Event Notification events … they are all pretty much the same thing. But wait, there’s more. Much more. How about this ‘extended’ term? Well, along with the specific set information that comes along with each event, XE allows you to add on a number of ‘actions’. For example let’s take the wait_info event. The following info comprises this event: duration, opcode, signal duration, and wait type. We can build on this info by attaching ‘actions’; aka Global Fields, in general stateless in contrast to stateful, and roughly analogous to columns in SQL Trace. After the wait_info event has fired we can extend it by adding these actions to include more info like session_id, database_id, sql_text, etc. You may have noticed the wait_info event info looks a lot like what you get back when you query sys.dm_os_wait_stats. And also, nothing at all like that is available in SQL Trace. Pick a DMV, any DMV, and there is a fair chance you’ll find that same info set (or part of it) is available in XE. So, here we have another way to think about the ‘extended’ in Extended Events – you get way more stuff than SQL Trace (I’m not sure this explanation of extended is technically correct according to MS, but it works for me). This brings us to part 2 where we will consider two more terms, but where I will not ask you to take a quiz. How many waiting events do you want to collect? A: ALL OF THEM because we can (umm, wait, no, not all of them… can we put some kind of filter on that? Yes, yes we can. And we haven’t even mentioned all the options where we can write the results). There you have it. A couple of my favorite things about XE – #1) aha moment regarding events and event consumers in SQL Server and #2) aspects of XE open up new troubleshooting and problem solving methods … Not too tech, hope y’all don’t mind. Just some ideas around how to think about this new tool. I imagine other TSQL-Tuesday posts will be more technical and I’m looking forward to reading those and learning. Thanks for reading! This entry was posted in Database Admin, TSQL Tues and tagged extended events on June 9, 2015 by admin. (UPDATE: since writing the above I’ve read documentation that AOAG will be available in SQL2016 Standard Edition which is great news. But the limits on SE AOAG include 2 nodes only, non-readable secondaries, and one DB per availability group. DBM is also still available in 2016 SE, but now that the AOAG setup in SE is more or less just like a DBM session perhaps 2016 will be the final version including DBM). When you configure the DBM partner via TSQL you have the option to explicitly set the timeout parameter. This is number of seconds the DBM session waits for a ping response from another partner (principal, witness or mirror) before going into panic mode. The default here is 10 seconds. If the DBM session is an HA solution – “full safety” (synchronous) and auto-failover- then 10 seconds is the amount of time the servers can be out of contact before a failover is initiated. On the other hand, for a typical DR pair in “high performance“(asynchronous) mode, the databases will go in recovery or disconnected status, depending on their role, principal or mirror, respectively. It is pretty common to see TIMEOUT set as the default value. If the session is configured via SSMS, or even a TSQL statement that leaves out TIMEOUT, it’s going to be 10 seconds. This 10 seconds may be about right for a HA implementation, especially if you have a complete auto-failover set-up configured including a witness (which is the only correct way to do auto-failover) and some method to redirect the application connection as well as a high degree of confidence in the network. In short, if we know the partners will never be out of contact for more than 10 seconds, then this 10 second default could work. But for an asynch DR implementation? Consider that for good DR the mirror instance is remote. This often means a less reliable network, more prone to a glitch or a dropped packet here and there. Also, remember that the DBM session continues pinging even after going into disconnected status. As soon as a ping returns from the partner server the database status’ can cycle back through synchronizing to synchronized. So, really a 10 seconds panic threshold is too sensitive for a DBM DR session in the real world. And so concludes the most words ever written about the database mirror timeout parameter. By default the database mirror traffic between partners is encrypted, but like the 10 second TIMEOUT, that default value (REQUIRED) might not be ideal. Read up on endpoint encryption here. You could argue the impact of leaving the encryption enabled is negligible and that may be true, but, of course, part of a DBA’s job is to sweat the details. So, if encryption isn’t required it is worth considering turning it off, thereby improving throughput and gaining back those resources spent on encrypting\decrypting. YMMV. If you do go for it, check out this post from Remus R. which has pointers for making an on-the-fly change. Since we’re on the topic of encryption here’s a thought on database mirroring and Transparent Data Encryption (TDE). It can be done, no doubt, but be careful combining these two features. In the real world, to stay on budget, it’s pretty common for the DR partner in a high performance mirror session to be somewhat under provisioned – i.e. less CPU, less RAM, slower disk, etc. Remember that TDE data is decrypted when it is read off the disk, and encrypted when written to the disk. Decrypt\encrypt operations may not be a problem for a well provisioned production server, but the DR partner server might be struggling as the mirror session is continuously streaming transaction log records on to disk and all those writes must be encrypted via CPU cycles. Even more so if the DR partner is not the same caliber hardware as the production server. Test the workload before implementation and keep an eye on the CPU use to be sure the DR partner can handle the extra encryption work. Back in the old days DBAs used to worry about how many databases could be mirrored per instance before performance issue started to show up. Consensus was no more than 10. That rule didn’t apply for long (SP1 iirc), but there is at least one good reason to keep an eye on how many DBM sessions are up and running. As already mentioned, it’s common to see under-provisioned DR servers. In this case, rather than CPU cycles we are considering worker threads since DBM process’ require several. It’s interesting that the mirror instance actually requires more worker threads than the principal. 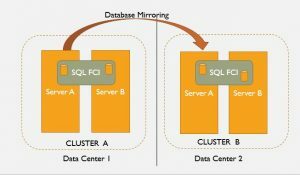 Here’s a good summary; “…database mirroring requires 2 threads on the principal server and at least 3 to 4 worker threads on the mirror server for each of the mirrored database in addition to 1 global thread on each of them. It is important to note that these calculations only reflect the number of worker threads required for administering database mirroring and additional threads are required for the core database server activity.” So, keep the worker thread capacity of the mirror instance in mind. You may need to increase max thread count (via sp_configure), limit the DBM sessions, or use a higher caliber mirror server. This KB article (quoted above) details how to calculate thread counts per CPU and points out some other ‘Things to consider when setting up database mirroring in SQL Server’ (in fact that is the title). If you have worked with AOAG you might be familiar with the step in the setup wizard when you can initialize an AOAG replica with the push of a button (figuratively). I love that. Alas, DBM does not have an ‘Initialize’ button. But if you are lucky enough to have a situation where your principal server backs-up mirrored DBs to a shared remote location which the mirror instance can also access you can build something along those same lines. This makes mirror builds easy and avoids taking fresh, out of cycle backups to initialize a DBM session. The following utility script does just that. It iterates through the msdb..backupset table and generates TSQL to restore the most recent full backup on the mirror side. It also generates ordered restore statements to roll on diff and tlog backups from the file share. The output includes SET PARTNER statements to initialize the session on both principal and mirror instance and should be copied into and executed in a SQLCMD window so as to leverage the :CONNECT command. With some tweaking and some manual backup file copying it could be made to work for other scenarios where backups are local or are not on a shared disk. It’s nothing too fancy, but it has saved me time and hassle especially when faced with a project that requires many DBM session to be built in a short-as-possible time. P.S. Don’t forget to disable tlog backups while you are restoring the logs. Note the script is in 2 sections because of some limits of the formatting tool – i hope you don’t mind, I’m working on that problem. …. but wait, there’s more …..
Well I suppose most everyone knows this but I can’t help mention it because I think it’s interesting. Say you have a situation where the principal instance goes down and you want to bring the mirror instance DB online. A disconnected mirrored db has a status of recovering. Leaving aside all the details around lost data and split brains and so on, how do you simply bring the DB online? That’s it. No FROM DISK= , no ALTER DATABASE, no nothing but WITH RECOVERY. When the principal disconnects, the mirror instance is all synched up and transactionally consistent. It’s the same situation when rolling on tlogs, if the final log is restored with no recovery, the DB just needs this last statement executed. This comes into play when doing migrations, in some cases rather than failing over the session, it can work just to disconnected the principal and run this command on the mirror DB to bring it online. All it needs is that one last RESTORE. For a long time I considered the mirror session safety as a static setting; this DBM session is high-safety, that other one is high-performance, and so on. But struggling to keep the mirror session from getting too out of synch on a large DB during index rebuild made me start thinking of it more as a toggle switch. Turn on high-safety all production day long, switch to high-performance for nightly maintenance. Or conversely, depending on circumstances, you might find that operations that have high impact on mirror session latency can better be handled by using high-safety. This effectively guarantees the session cannot get out of synch (though it may require a longer maintenance window). So, there are a couple ways to think about it, and – assuming EE and no witness – it’s usually not a big deal to flip a session in or out of asynch and synch modes according to the need. Testing may reveal the best approach. Viola, a secondary ‘snapshot’ readable copy of the mirrored DB on the mirror instance. As mentioned in the Migrations topic above, a synchronized database mirror is transactionally consistent, it just needs to be brought on line. Note, it’s been way back since SQL2005 since I tried this hack technique. If you try it, please let me know how it goes ;). This entry was posted in Database Mirroring and tagged mirroring, putting it into practice, tips on June 3, 2015 by admin. Not everything is small in Flatland. Remember that cool old book Flatland? Or maybe you saw the movie? Aside from the mashup title where I’m confounding VLFs and VLDBs this post has really not too much to do with Flatland (sorry). Except that, as you must know by now, I am a square. VLFs are logical management units within transaction log files – when a log file grows, it grows in VLF ‘blocks’, and when a log file truncates or shrinks, these operations also are applied to the file in blocks of VLFs. Additionally, during any database recovery operation (including cluster or mirror failovers, service restarts and database restores), each VLF within a t-log is examined to determine whether there are active transactions to roll forward. As you might imagine, an excessive number of VLFs can result in unnecessary overhead and delays in recovery time. Notice a DB that is taking an extra long time to come online after a service bounce? VLF count is the first things to check out. Small values for a transaction log file auto-grow setting are the typical reason for too many VLFs. A good rule of thumb is that the auto-grow setting should be configured to generate VLFs of about 512 MB to 1 GB. Of course, the best solution is not to rely on auto-growth and manually size the transaction logs if and when you can. Either way, here is what you need to know to grow and\or set the auto-grow value. Using these algorithms we can control a log file’s growth to achieve something close to the ideal 512 MB – 1 GB VLF size. In my experience the re-sizing process is usually part of a larger project to reduce VLF counts. The following steps outline the whole effort. This is a simple and effective way to get close to the file size and VLF count you want without getting lost in the minutia or splitting too many hairs. Before you shrink the log file take note of the current size in MB, assuming this is the correct size, or make a note whatever the proposed new size should be. Shrink, backup, repeat as necessary to minimize VLFs. This works best in a time of quiet so the log can clear easily. If there are many VLFs, quite a few transaction log backups may be required between each shrink since the shrink clears only the unused VLFs. Keep tabs on things as needed by noting the results of the DBCC Shinkfile. Divide 8000 MB into the original size (or proposed new size), round up, and grow the log back that many times in multiples of 8000 MB (use 8000 MB b\c there is a bug in 4000 MB growth increments ). To explain, since each log file grow over 1 GB creates 16 VLFs, the 8000 MB grow results in approximate ideal VLF size of 512 MB. For very large transaction log files – say over 240 GB – the growth statements can be issued in multiples of 16000 MB to create approximately 1 GB VLFs. For smaller size logs –say less than 4 GB – a single growth statement is usually fine. Don’t pet the sweaty stuff. Thank you for reading and happy shrinking\growing! This entry was posted in Database Admin and tagged db files, t logs, vlfs on May 27, 2015 by admin.